We first got to know Le Mesturet during a food and wine-tasting with our wine-tasting circle and have been back many times since particularly in winter. Since it’s very close to the stockmarket (Bourse), it’s a popular lunchtime venue. The menu changes with the season so at the moment, it includes hare pâté with pear chutney, velouté of pumpkin with grilled black pig pieces, venison shepherd’s pie with wood hedgehog mushrooms and sweet potatoes, deer civet with celeriac purée and chestnuts and wild boar cutlets with Grand Veneur sauce, red cabbage with smoked bacon pieces and spiced apple sauce. All delicious! Average entrée price 8 euro, main course, 15. Entrée + main course + dessert = 28 euros. 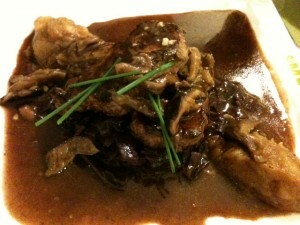 Restaurant open every day from 12 noon to 3 pm and 7 to 11 pm (last order). 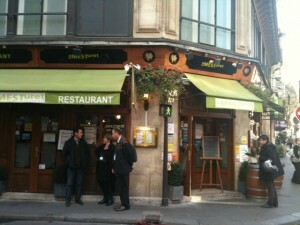 This entry was posted in Paris, Restaurants and tagged game, Le Mesturet, Parisian restaurant, wine tasting. Bookmark the permalink. Endroit très sympathique, excellent rapport qualité prix !